We picked up the first of the sweet corn at the farmers market this weekend. That night we grilled some up to have with steak and Matt suggested we grill a few extra to use on pizza later in the week. We had also bought some hickory-smoked bacon from the Sunshine Farms, so we decided to pair them. This is a sauceless pizza, which is actually they type I prefer. Sometimes I feel like the sauce can overpower all the other flavors and if I want tomatoes I'll just add sliced fresh one. 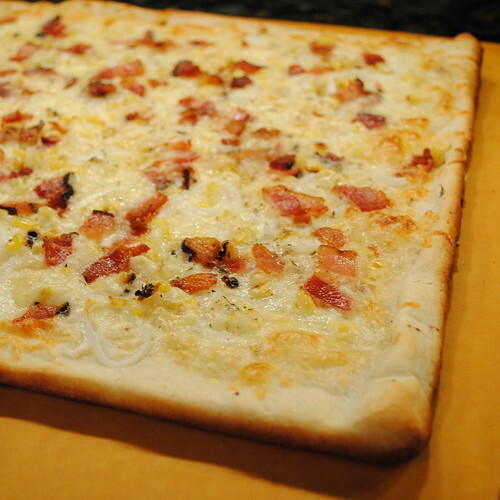 Back to this pizza, it is a wonderful combination of sweet and salty and seems lighter than your regular pizza despite all the cheese. Matt added a peppercorn dressing base as a seasoning on top which gave it a nice peppery bite. Cook the sweet corn until crisp tender. You can just boil it or do what we did and brush it with a little olive oil and grill it. Let cool and cut the kernels from the cob. Set aside. Roughly chop the bacon slices. Cook until crisp. Drain on a paper towel. Set aside. Spread out your dough to the desired thickness. Brush all over with the buttermilk, you may not use it all. Top with cheese. Sprinkle the corn kernels, bacon and onion on top. Season with the peppercorn dressing base. Bake for 13 minutes until the cheese is melted and bubbly and the crust is golden brown. My fiance, like most men, loves bacon. I can not wait to try this out on him! excellent use of corn. we've been eating a lot of corn on the cob and plain old tomatoes. perfect. This sounds so great! We always disliked corn on pizza in Brazil, but that's because it was canned corn. This is an entirely different story especially with that bacon. 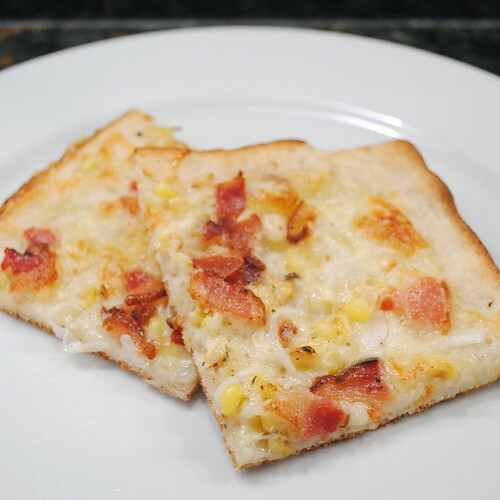 I am very sceptical about corn on pizza, but I love bacon! I will have to try this combination.